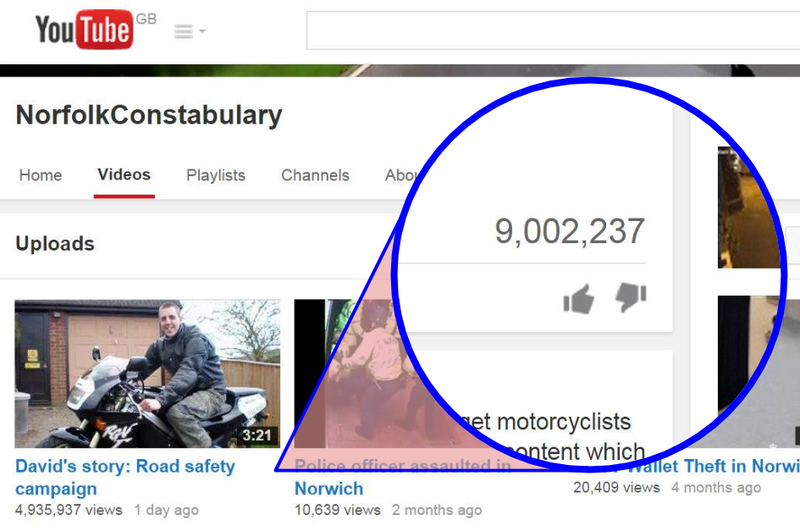 The previous highest viewed video was by +Essex Police for a murder appeal (Nahid Almanea) with 726,000 views. On 30 Aug 14, the BBC (and others) posted Ashya King: European arrest warrant issued for parents. 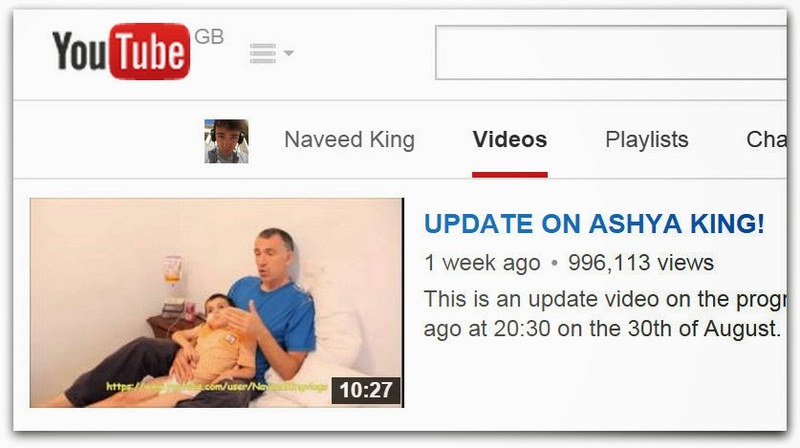 (Ashya and Naveed's father) was sat on a hospital bed with Ashya and spoke for ten minutes. That video now has 994,712 views. This post is the story of those two videos and how the BBC were severely lacking in linking to each one. It's not only the BBC, other mainstream news orgs were not that great either. 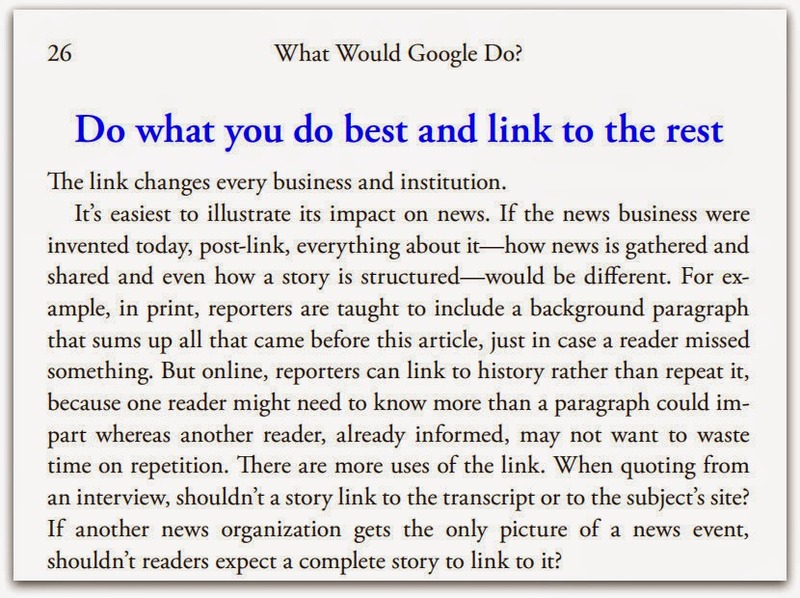 Links and Feeds, Scope - Linking is the essence of the web. BBC strategy is to turn BBC Online into a window on the web and to double monthly clickthroughs to external sites ... 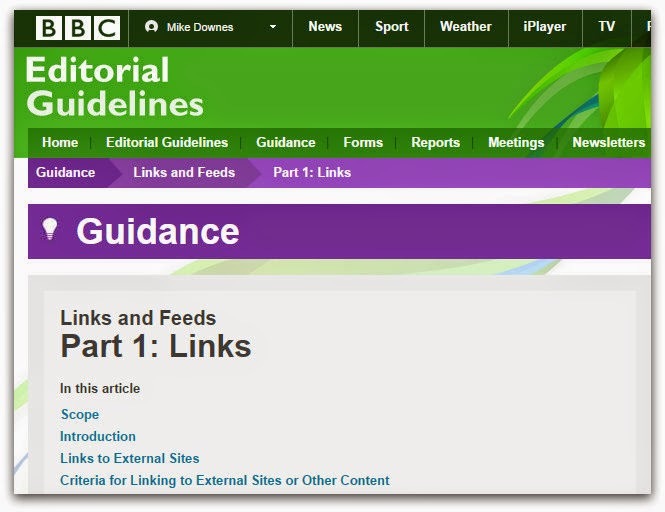 This Guidance Note is designed to help you select and manage suitable external links to other sites from BBC Online. Links to External Sites - Part of the BBC's role is to act as a Trusted Guide on the web. Whenever producers are creating content on a BBC site, they should actively consider which external websites it may be editorially justifiable to link to. All links on the BBC public service site or on the editorial pages of a commercial site must be editorially justifiable. Links are not acceptable as a form of credit. Let's take the David Holmes example first. 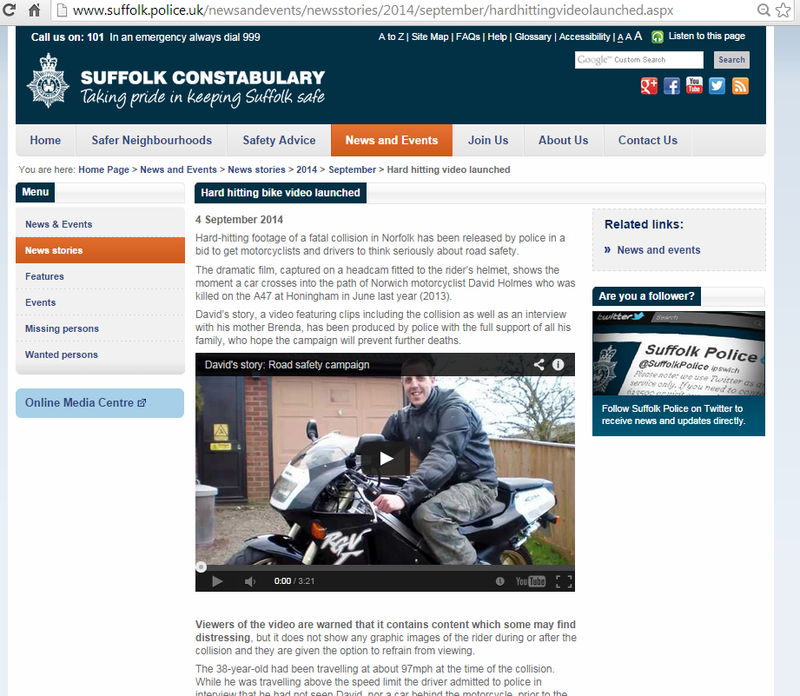 You can read the Norfolk and Suffolk Police press release Hard hitting bike video launched (Norfolk) and Suffolk (text is the same for both). You also need to watch how the story has been covered at News.Google.com. There are hundreds of links, but let's stick with the BBC for now. There are three stories. BBC News, BBC News Norfolk and BBC Newsbeat. 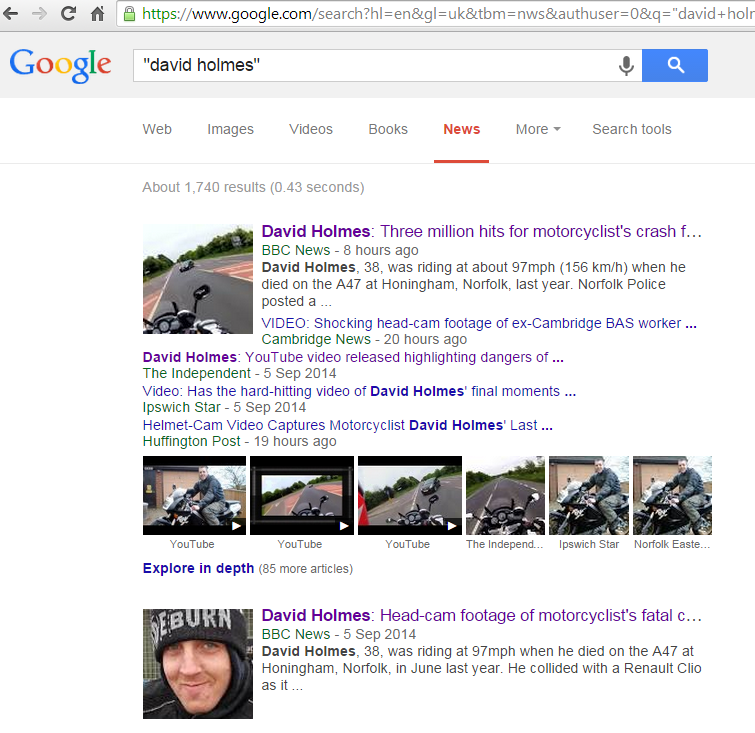 In the first, David Holmes: Head-cam footage of motorcyclist's fatal crash we have a two minute BBC video, youtube is not mentioned, all we get is ''Police have released footage.'' There are no links to anything - not even Norfolk Police. There were three additional photos, no mention of youtube at all, but we did get five links to other news sites (one being Suffolk Constabulary). Norfolk Constabulary was offered as a related internet link - which is useless as it was www.norfolk.police.uk. The BBC do this all the time, link to a company or org like www.google.com. 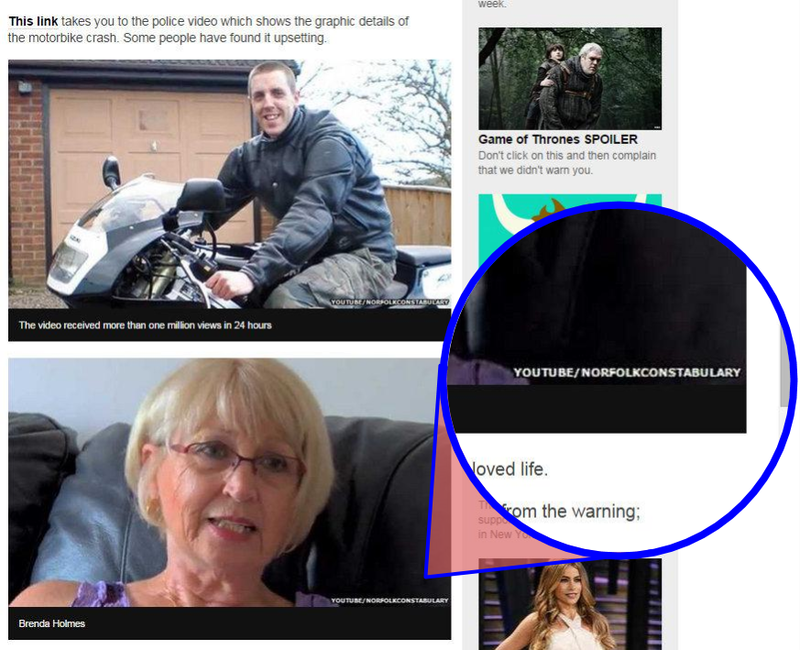 It's not until we see the BBC Newsbeat post that we can vaguely find a link at Rider's fatal crash shown in police safety video, with ''This link takes you to the police video which shows the graphic details of the motorbike crash. Some people have found it upsetting''. 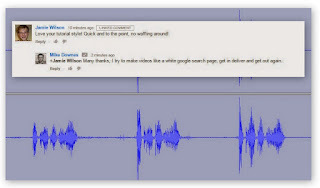 YouTube in not mentioned in the post, but there are two images showing YOUTUBE.COM/NORFOLKCONSTABULARY as annotations. That's it, you could argue the BBC are a Radio and TV Station and not a newspaper. That may of had some truth before the internet, but BBC Online has been here since first launched on December 1997. My Conclusion The BBC way of reporting news like this is outdated. In this example, Norfolk Police is an Official Source and should of been linked to immediately. The video was not UGC (user generated content) and therefore needed verification. The message was simple after all - to save a life. +Jeff Jarvis wrote in 2009, Do what you do best. Link to the rest - I think he's still quoting that today, as am I (What Would Google Do, page 26). For me anyway, a Police video about saving lives ticks that box. As there are 3,452 words on that BBC Links and Feeds, Part 1: Links page alone - I will stop listing reasons why BBC News could do better and just move on. In the Aysha King example, there are many issues to consider (most of them legal, as everyone knows I'm a former teacher, not a legal expert - that does make me someone who can consider what maybe considered fair, as much as anyone else (reading this). Before we even start, there are a few worrying details (if I were the BBC). 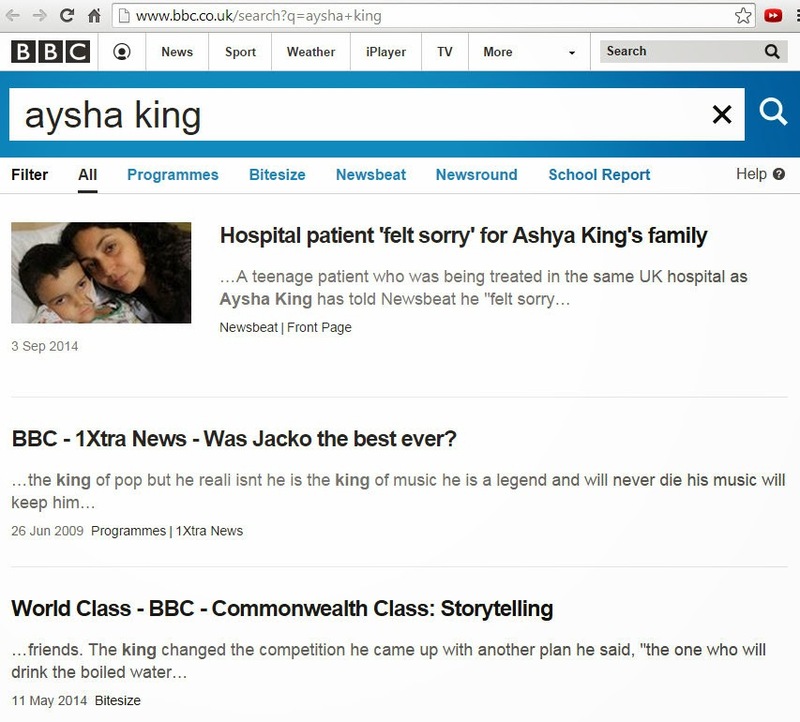 First, on searching http://www.bbc.co.uk/search?q=aysha+king there is just one result and that's Newsbeat. Thankfully, on a google search site:www.bbc.co.uk aysha king we do get 187 results. Moral there, search Google, not the BBC. As a timeline, one of the BBC's first posts is Ashya King: European arrest warrant issued for parents where, in my view, this was a short post that had text added as the day unfolded. In the BBC video clip (of 2:23m), two video clips were shown from the Naved King YouTube channel. The reporter talked of, and over the ''internet video'' (as he called it). The two original NaveedKingvlogs clips were 10:27 and 2:55 in length (that's 13:22m in total) - of that, just 35 secs were shown on screen, 11 secs with Brett or Naveed's voice - the reporter talked over them both. No links were made back to the original channel - is this fair and reasonable? This is an update video on the progress of Ashya, he was taken away by police around 1 hour ago at 20:30 on the 30th of August. This video will explain what my father did and why. I give permission for all to use this video as long as the full video is shown or only if a link is given to this video. Only reason if people and companies twist stories for their benefit to make it sound better or more interesting to watch. Just received word that hundreds of people wanted to send money to him, I think thats okay, but if its not then I will remove it from the description. As of Sat 6 Sep 2014 (9:50pm UK time), this video has 995,650 views, 4,098 comments and 2,616 shares. My own comment/share had 91 google +1s/likes and fourteen comments. It's widely accepted without this video upload (featuring the father Brett King) was critical in turning this story from runaway monster to caring parent. What should the BBC have done? Linked to youtube, shown the full video or just as they did, mention it vaguely? The test maybe to compare. +The Guardian did eventually embed fully with Parents arrested as missing Ashya King found by police in Spain. The Mirror did embed the full video, yet later replaced it with an edited three minute clip (30 Aug 14). We also know the Aysha King story is far from over. 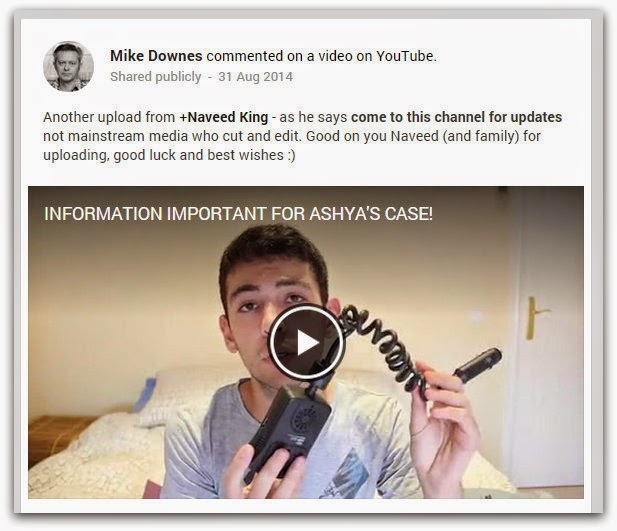 There were two more uploads by Naveed King - one of thanks and the latest giving details of an official fundraising account. The real reason I written this post is to make sense of what happens next and where to go. How much can we rely on mainstream media to deliver anything sensible (as a story breaks) and how do we compare versions rapidly? For with the BBC, I find myself reading what they say and then checking other sources to see if what they say is anyway accurate - or where they sourced the story from. And with that, as the people have the tools to report the news ie the police with David Holmes Road Safety and the Aysha King family - who really needs mainstream media? time, Sat 6 Sep 14, the David Holmes is at 6.2 million views - it was 5.1m when I started on this post. There is another serious side that's developing rapidly too - and that's terrorist videos and how they are fast to get blocked and removed. As The Guardian notes, Police warn sharing James Foley killing video is a crime. For me, the place to go is Google News and Realtime Coverage. Remember Google News has this note, ''The selection and placement of stories on this page were determined automatically by a computer programme. 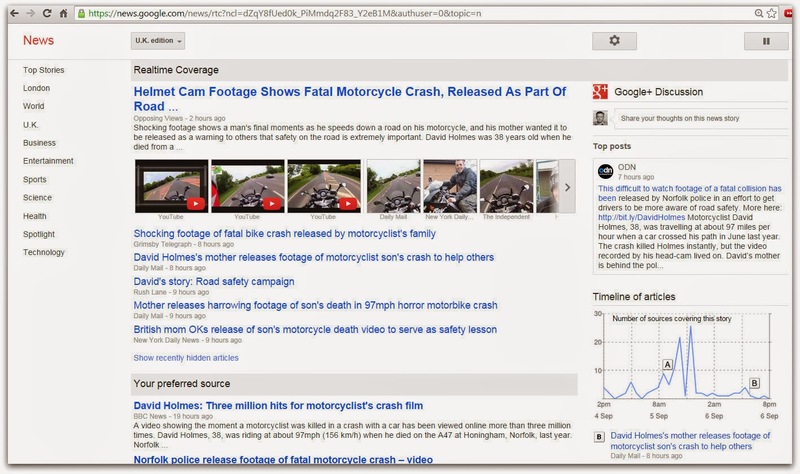 The time or date displayed reflects when an article was expanded or updated in Google News''. The text of the title is found 23,100 times on the web and that identical first sentence is found on the web 1,900 times. I will be posting more on Realtime Coverage as it's an important topic to look into - it's been available for over two years.